I love tea! While growing up in the southern U.S., my older sister regularly brewed iced tea in the sun, and it was super refreshing on a hot day. Then I moved to Canada and gained an appreciation for hot tea. I learned how hot tea can warm your bones, soothe your aches, and calm your mind. When I ended my addiction to soda in 2009, hot green tea (See What are the Health Benefits of Green Tea?) and a variety of herbal teas became my staple drinks. Then I moved to London, England where tea is integral to the culture. I learned about white tea, Ceylon tea, etc., and I gained an appreciation for chai tea with milk. 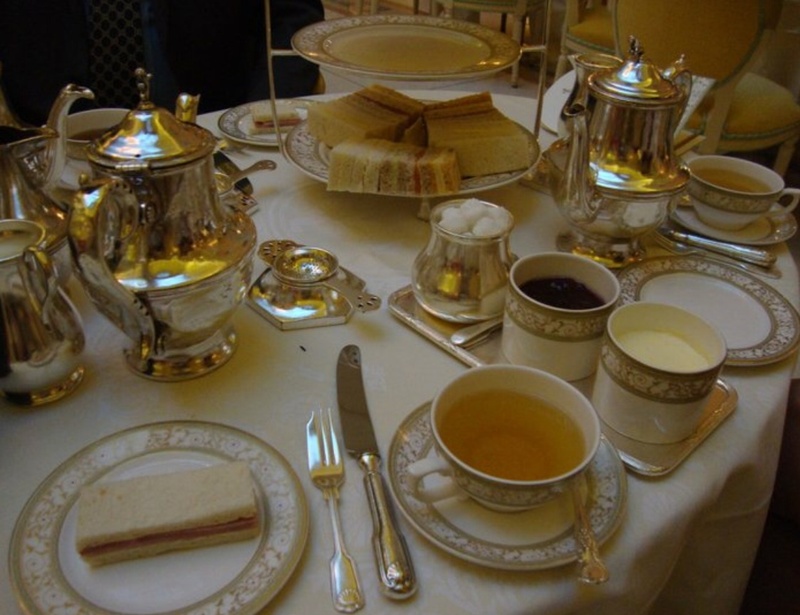 I experienced my best tea drinking experience ever: high tea at the Ritz-Carlton in London. I sipped on endless premium teas and ate cute little tea sandwiches and desserts. Then I moved to the Netherlands where I learned about my new favorite 2 types of tea: fresh mint (just add a branch of mint leaves to hot water) and lemon & honey (just add an actual lemon chunk, plus real, raw honey). Now I am back in the southern U.S., and although my tastes have expanded, I was still looking forward to the tea experience. When I drink iced tea, I tend to drink multiple large glasses, and the amount of caffeine is much too high for me. I experience pain more easily, and my sleep is restless. Unfortunately, finding iced herbal tea at restaurants is next to impossible. Buying “real” tea from a store is a challenge. Most grocery stores carry only highly processed brands of tea. Keurig machines are quite popular these days because Americans love convenience (and apparently, non-recyclable plastic). I am not a fan of brewing my tea via hot plastic (See The Potential Dangers of Your Keurig K-Cups). Most shopping malls now have a Teavana store with a large variety of loose-leaf teas. However, soon after they were bought by Starbucks (on December 31, 2012), they significantly changed their product/profit strategy. In early 2013, when I first moved back to the U.S., I bought a wonderful variety of completely organic “real” (See my blog post Loving the Food that Loves Me Back) teas with from Teavana. I recently returned to Teavana to buy more, and all of those “real” teas were replaced with teas that contain natural and artificial flavors and emulsifiers. When I told the clerk that I will no longer be a customer of theirs, she started giving me a speech about how ALL food is processed and that additional chemicals MUST be added. I was saddened by how brainwashed she is. I have since discovered Numi as an excellent brand for organic tea in the U.S. My favorite tea product is organic Chai rooibos. The experience of sipping hot tea is NOT something special in U.S. restaurants. I am sure that there are some authentic tea houses that know how to serve tea well. However, it seems that most American restaurants have no clue… or perhaps no choice. Tea costs $12 at the Hyatt. Well, it better be awesome! I have been staying at a Hyatt hotel in Atlanta, Georgia this week. My hotel room rate includes a free breakfast buffet. 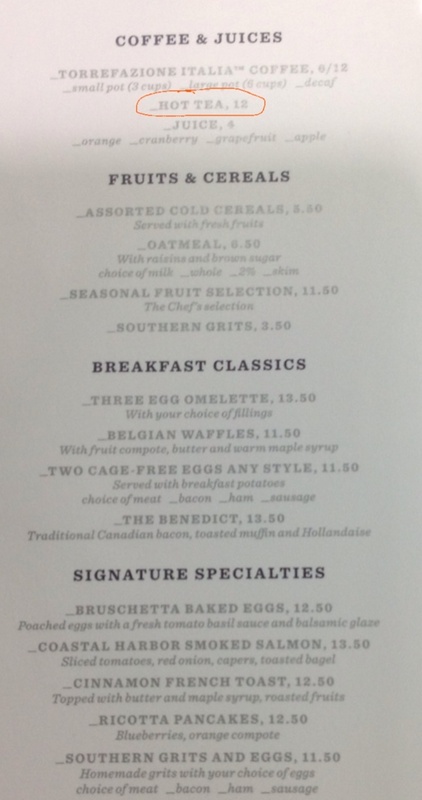 The regular cost of a breakfast buffet is $14.95. However, if you don’t want the buffet, you can just order off the menu. Let’s say you just want some tea. A pot of tea costs $12. Seriously. $12! This should be some special tea! Shortly after ordering tea, I was given a small pot of hot water; it was the same size as my mug, so I didn’t see the point of the pot. I was also given a choice of 5 flavors of Tazo brand teas. (As with Teavana, Starbucks is also owner of the ubiquitous Tazo tea.). On the table was some sort of uncovered creamer/dairy product. For some reason, that doesn’t seem very appetizing. There was also a container of 5 different kinds of chemical sweeteners. To be fair, I saw other tables had some “real” sugar packets too, but even that option is most likely made from genetically modified beet sugar (See All About Sugar and How to Switch to the Real Stuff). Options for sweetening my tea in the U.S. Gross! Fortunately, I like my tea unsweetened. I drank it. It tasted like flavored water; good enough. I asked for more hot water. They brought out a second, larger teapot, except that there was no lid on that teapot. I asked for a lid, but the waitress said, “We have lots of large teapots, but no large teapot lids.” My reaction was that it seemed odd, and she assured me it wasn’t odd because “teapot lids are just like socks in a dryer; they just always go missing.” She then proceeded to tell me that she solved her missing sock problem at home by placing a safety pin on all her pairs of socks. I guess that solution just didn’t apply to missing teapots lids. 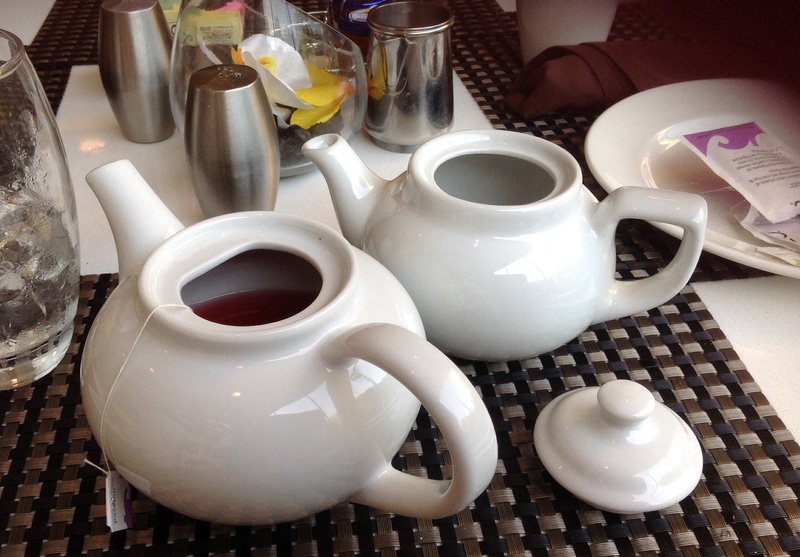 If you order a large pot of tea at a Hyatt hotel in Atlanta for $12, don’t expect a lid. Only small pots have lids. 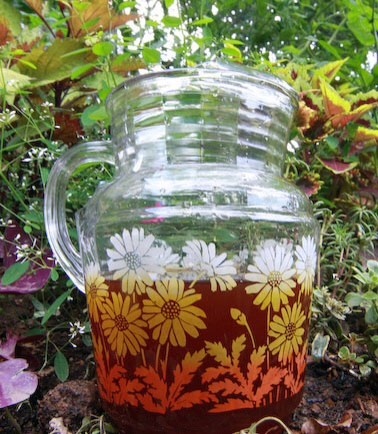 My conclusion is to simply make my own hot and iced tea from fresh, organic ingredients rather than relying on technology and “enhanced” tea products. I buy mint, lemon, and raw honey from my local farmers’ market. I also always have my favorite organic Chai rooibos tea on hand. I agree with Arthur Dent’s desire for tea in Douglas Adams’s Hitchhiker’s Guide to the Galaxy series: “Dry leaves in a cup of water” please! A reader let me know of two other ethical tea companies who use organic and “real” ingredients: Republic of Tea and Yogi. I am looking forward to trying them both.